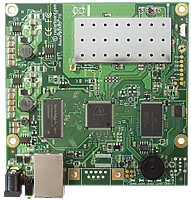 The RB711 is a small RouterBOARD wireless router with an integrated 5GHz 802.11a/n wireless card. Perfect for making low cost AP devices. RB711 includes RouterOS - so it can be a router, firewall, bandwidth manager, a CPE /AP and more - or all at the same time. This device is available with one MMCX connector (802.11n one chain).